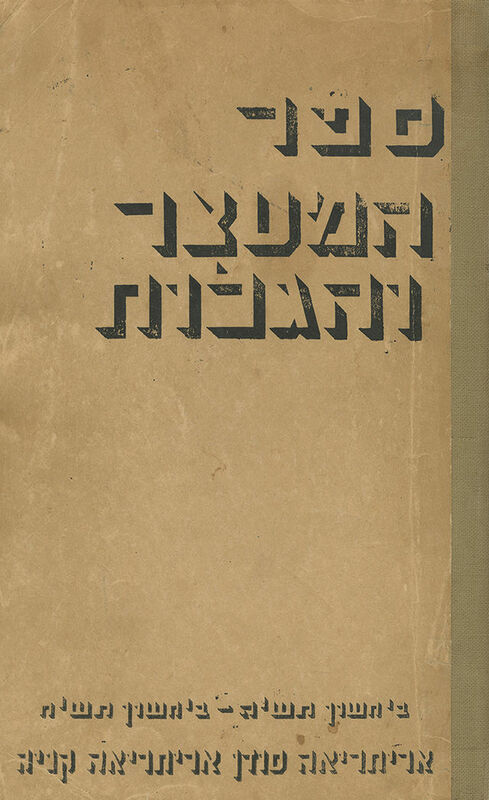 Sefer HaMa'atzar VeHagalut (Shalosh Shanim LeGalutenu) [The Book of Detention and Exile (three years to our exile)] / "Badad" – periodical for philosophy and literature. "Detention camp of Jews in exile", Gilgil, Kenya, 1947. Thick book, mimeographed, with illustrations, diagrams, charts, sheet music, appendices and maps. A comprehensive study of the three years spent by the Etzel and Lehi exiles in detention camps in Africa. A handwritten note to David Linivsky (Niv), one of the book's editors, was bound in the book. The note reads: "To David Linivsky from Rivka and Moshe Ben-Gal (Bachar), 'Good Luck'!!! 11.7.49". 321,  leaves +  photograph plates. Leaves 11 and 301 were bound twice. 33 cm. Some stains and markings in pen. Creases. Some tears at margins of leaves. Rough tears at margins of two leaves, affecting the text. Creases and tears to cover. The cover is restored, cloth spine.